US President Donald Trump’s former lawyer Michael Cohen has admitted he lied about a Trump property deal in Russia during the 2016 election. Cohen pleaded guilty to lying to Congress. He said he did so out of loyalty to Mr Trump. Mr Trump said his former right-hand man was “lying” to prosecutors in the hope of receiving a reduced sentence. A special counsel is investigating Russia’s role in the 2016 election and whether Mr Trump colluded with it. In August, Cohen pleaded guilty to violating finance laws during the 2016 election by handling hush money for Mr Trump’s alleged lovers. Appearing unexpectedly before a federal judge in Manhattan on Thursday morning, Cohen, 52, pleaded guilty to one count of making false statements to Congress. He said at the hearing that he had submitted a false written statement about a Trump Organization plan to build a skyscraper in the Russian capital. “I made these misstatements to be consistent with individual 1’s political messaging and out of loyalty to individual 1,” Cohen said in court. He has previously identified “individual 1” as Mr Trump. Cohen was interviewed in October last year behind closed doors by lawmakers conducting their own investigation into whether Mr Trump’s campaign worked with Russia to sway the US election two years ago. According to the criminal complaint, he told the Senate and House intelligence committees that talks over the Moscow project had lasted from September 2015 until January 2016, while Mr Trump was running for the White House. But the criminal complaint says that “as Cohen well knew”, negotiations over the Moscow project continued until June 2016. Cohen also told lawmakers he had had limited contact with Mr Trump about the project, when in fact it had been “more extensive”. Prosecutors said Cohen had tried to give a false impression that the Moscow project ended before the Republican presidential campaign properly began in 2016. In a press scrum outside court, Cohen said nothing to reporters. Up until now, Michael Cohen had been a tangential figure in Donald Trump’s Russia-related headaches. After his plea agreement with the special counsel’s office, however, he’s now smack dab in the middle of Robert Mueller’s probe. In particular, Cohen is sharing information with the special counsel about Mr Trump’s Russian business interests – including efforts to build a Trump Tower in Moscow – which, according to the president’s former personal lawyer, continued well into Mr Trump’s presidential campaign. That runs counter to the president’s continued insistence that he had no financial ties to Russia – an assertion he frequently made when questioned about his past praise of Russian President Vladimir Putin and efforts to improve US-Russian relations. If Cohen can provide evidence supporting his claims, it would be a political nightmare for the president and, if Mr Trump made false claims in his recent written testimony to Mr Mueller, a legal one, as well. The president has been tweeting furiously about the special counsel team in recent days, and given the steady drumbeat of news on Mr Mueller’s investigation, it feels as though a crescendo is approaching. As he left the White House for a G20 summit in Buenos Aires, Mr Trump told reporters of Cohen: “He’s a weak person and not a very smart person. Soon after those remarks, Mr Trump abruptly cancelled a scheduled meeting with Russian President Vladimir Putin in Argentina, citing the current Ukraine crisis. What else has Cohen admitted? Cohen once famously vowed he would take a bullet for Mr Trump, but in April this year the pugnacious attorney’s home and office were raided by the FBI. In August Cohen, who had been Mr Trump’s personal lawyer for more than a decade, pleaded guilty to eight criminal charges, including tax evasion, bank fraud and campaign finance violations. 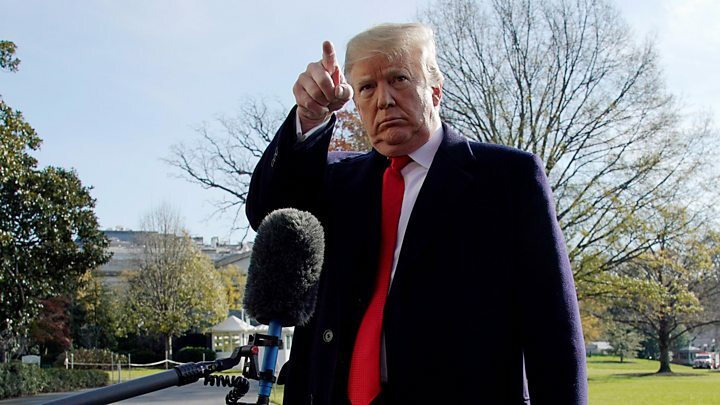 He said he had paid hush money to two women who alleged they had affairs with Mr Trump, at the direction of “the candidate”, implicating Mr Trump. In September, Cohen’s lawyer said his client had been providing “critical information” to special counsel Robert Mueller’s investigation.